It’s just a perfect day! It’s just a perfect day, you will be glad you spent it with us! 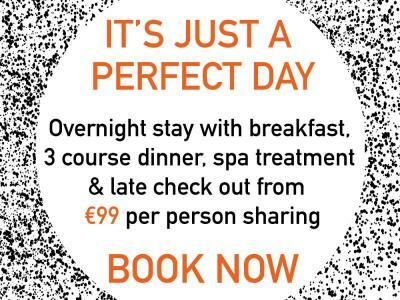 This is an offer not to be missed: Enjoy a one-night stay in the award-winning Absolute Hotel Limerick for 2 people with a full Irish breakfast the next morning and a three-course evening meal in Harry’s on the River Bar & Restaurant,1 spa treatment choose from: Back Massage (30 minutes)/ Makeup/ Mini manicure/ Mini pedicure/ Curly blow dry.